Tennessee offensive lineman Zach Fulton (72) takes on Western Kentucky defensive lineman Bryan Shorter (94) in this file photo. 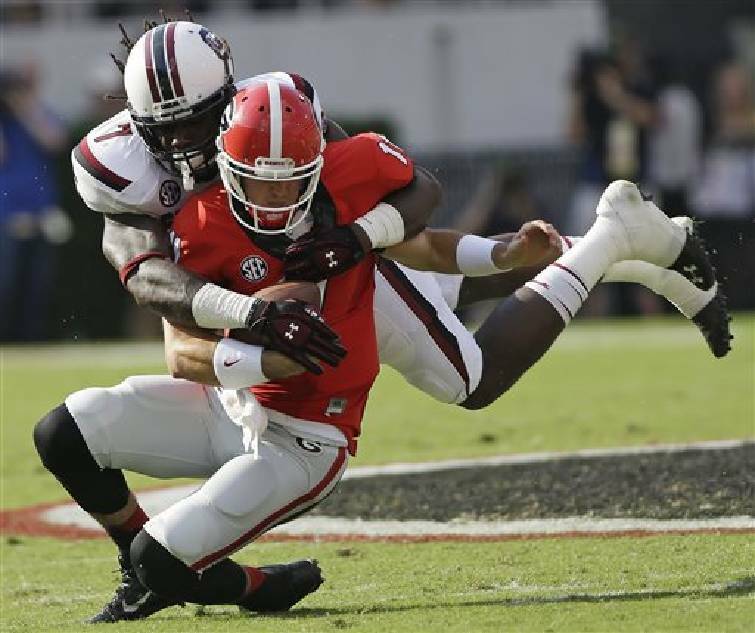 South Carolina defensive end Jadeveon Clowney (7) tackles Georgia quarterback Aaron Murray (11) during an NCAA football game in Athens, Ga., in this Sept. 7, 2013, file photo. KANSAS CITY, Mo. - After the Kansas City Chiefs spent two days bolstering their defense with lesser-known prospects, they went after some big names to help their offense on the final day of the NFL draft. The Chiefs spent their fourth-round pick Saturday on dynamic playmaker De'Anthony Thomas, whose good buddy Snoop Dogg tweeted his approval a few minutes later. Then in the fifth round, Kansas City nabbed Georgia quarterback Aaron Murray, once considered a first-round talent. The Chiefs wrapped their draft by adding a pair of offensive linemen in the sixth round. Zach Fulton is a mammoth guard from Tennessee, while Laurent Duvernay-Tardif is a raw tackle who played at prestigious McGill University in Canada while studying to become a doctor. The Chiefs grabbed defensive end Dee Ford out of Auburn in Thursday night's first round, and defensive back Phillip Gaines out of Rice in the third round Friday. The Chiefs may have found in Thomas a replacement for return specialist Dexter McCluster, who signed with the Titans in free agency. Thomas set school records for punt and kick return yardage at Oregon, and while he was showcased more as a running back last season, he also has good hands. "I feel like I'm an entertainer on the field," said Thomas, who departed Oregon after a junior season cut short by injuries. "I have a passion for this game." The Chiefs already have Pro Bowl running back Jamaal Charles - another former track standout - and bruising Knile Davis, their third-round pick a year ago. That means Thomas likely will evolve into a pass-catching threat rather than an every-down running back. "First and foremost, he's explosive," said Trey Koziol, the Chiefs' scout for the West Coast. "He has world-class speed, ran on the track team at Oregon. Just versatility." Thomas first started turning heads as a 12-year-old playing in a Pop Warner league for rap star Snoop Dogg, who claims to have given him the nickname "Black Mamba." "You know, when it comes down to it, you have to look at what you see on tape," Koziol said. "You don't see this kid get caught from behind. ... The speed on tape doesn't lie." Murray was considered one of the nation's top quarterbacks as a junior, but elected to return to the Bulldogs for his senior season. The SEC's career passing leader ended up tearing his ACL on Nov. 8 and did not work out during the NFL scouting combine. He will compete with Tyler Bray for the third-string job behind starter Alex Smith, who is entering the final year of his contract, and Chase Daniel, a quarterback with a similar skillset. "Aaron is a phenomenal leader," said Dom Green, the Chiefs' assistant director of college scouting. "Type of guy his teammates rally around. Just an overall very competitive player." Green said that while Murray did not run for timed measurement at his pro day he did look good throwing the ball. The Chiefs are hopeful his surgically repaired knee will be ready by camp. "There's no restriction right now. The doctors gave me the green light to do everything," Murray said. "I'm running, cutting. It's full-speed, full-go ahead." Murray said he knew the Chiefs were interested after an interview prior to his pro day. "We were supposed to talk for 45 minutes, and it ended up being an hour and 45-minute meeting," he said. "I got a great feeling after that meeting. It felt great. The scheme that we were doing at Georgia was the same as what they're doing up there. It was a great fit." Fulton should be able to provide depth along an offensive line that lost three players to free agency who started last season. That includes Geoff Schwartz and Jon Asamoah, who played right guard - the same spot where Fulton is most comfortable. Duvernay-Tardif may be among the most intriguing prospects in the draft. He played in obscurity in Canada but turned heads at the East-West Shrine Game, not only for his raw physical skills - he's only played the game for a few years - but also for his intelligence. He has one year of study remaining to become a doctor. "My goal was a year ago to play in the CFL," Duvernay-Tardif said. "And after that, I went to the Shrine Game and everything went really well, and after that I thought, 'Oh, dang! I think the NFL is the place for me to play."